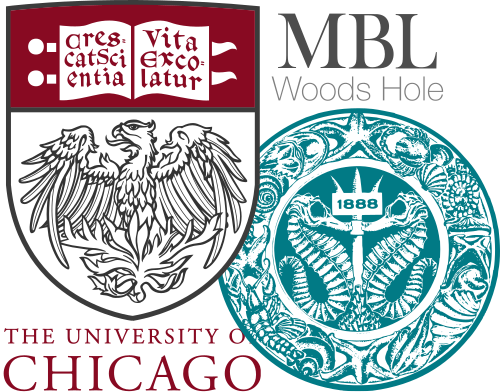 A note from the Meren Lab: We are very thankful to Bryan for sharing his expertise on behalf of all anvi’o users who wished to know more about the phages lurking in their metagenomes using VirSorter. Bryan is currently a PhD Candidate in the Sonnenburg Lab, Stanford University School of Medicine. Metagenome studies are a great way to explore complex communities. Many algorithms and tools have made it possible to reconstruct bacterial, archaeal, and even eukaryotic genome bins for diverse organisms from assembled metagenome sequencing data. However, these algorithms are not well equipped to deal with the most abundant biological entity on earth – bacteriophages. There are several tools designed to predict viral contigs from metagenome assemblies, and prophages from bacterial genomes. This tutorial will walk you through the steps needed to (1) use VirSorter to predict which contigs in your assembly are phages, and (2) visualize these results in anvi’o using the programs anvi-interactive and anvi-refine. The only thing better than binning with anvi’o is phage-aware binning with anvi’o. Here we go! The VirSorter input is a single FASTA file. In our case this will be the same metagenome assembly you used to make your anvi’o contigs database. 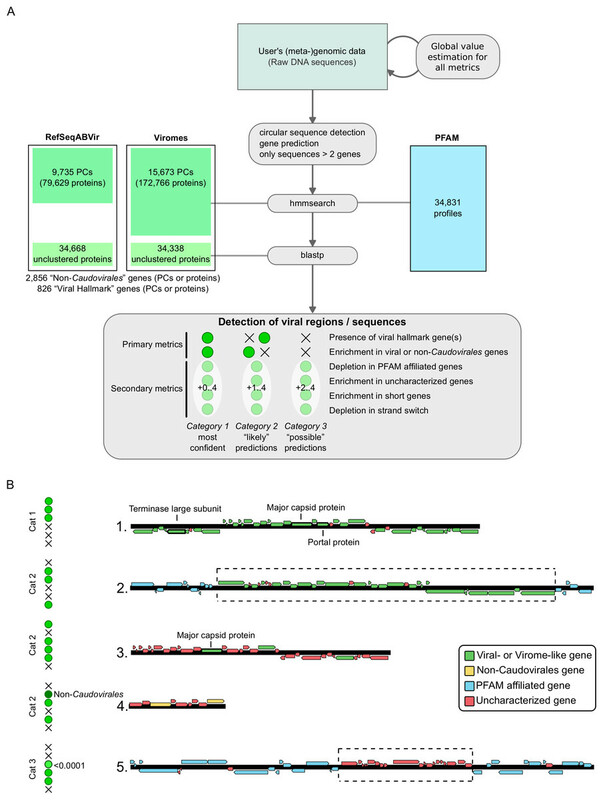 VirSorter annotates the FASTA file using MetaGeneAnnotator (Noguchi et al, 2006), and then uses hmmsearch (Eddy et al, 2011) to predict (1) PFAM domains (Version 27, Finn et al, 2014) and (2) viral domains using pre-computed, downloadable HMM databases on the annotated genes. For each contig, VirSorter uses a sliding window analysis to identify regions of several genes that: (1) contain one or more viral “hallmark” genes (capsid, large terminase, etc. ), (2) are enriched for viral domains, (3) have few PFAM domains, (4) have many uncharacterized genes, (5) have many short genes, and (6) have many genes encoded sequentially on the same strand. Overlapping gene regions predicted by each criterion are combined. Depending on which criteria are met, the contig is assigned a category number, where 1 is high confidence that it the contig is a phage, and 3 is possible, but low confidence. If a category 1, 2, or 3 prediction on a conting encompasses > 80% of the contig, the whole contig is annotated as being a “phage”. If a category 1, 2, or 3 prediction on a contig encompasses <= 80% of the contig, then a subset of the contig is annotated as being a “prophage”. For metagenome assemblies, note that a contig annotated as being a “phage” could actually be part of a prophage but isn’t called as such simply becasue more than 80% of the genes are “phage-like”. If you don’t want to install anything, you can run VirSorter on CyVerse. Alternatively, you can run VirSorter locally using Docker, or by installing the codebase on your computer. Here I will explain how to install the VirSorter codebase on your own computer, which is what I recommend you consider doing. To manually install the VirSorter codebase you can follow the recipe down below. I have only tested these instructions on Linux (Ubuntu and CentOS), but if you have any questions feel free to contact me or leave a comment down below. VirSorter v.1.0.5 is much faster than previous versions because several steps are now parallelized. Unless you opt to use diamond (see VirSorter usage), the results from running VirSorter v1.0.5 should be identical to running v1.0.3. The commands above will create everything you need to run VirSorter, but VirSorter commands will not be available to you systemwide. To run VirSorter from any directory, you can make symbolic links to VirSorter/wrapper_phage_contigs_sorter_iPlant.pl and VirSorter/Scripts and place them in the bin folder for your “virsorter” conda environment. An example location of this bin folder is ~/miniconda/envs/virsorter/bin. Substitute this path with the path to the bin folder for your newly created “virsorter” environment. To run VirSorter you will also need to download MetaGeneAnnotator (Noguchi et al, 2006). I like to just put this in the virsorter environment’s bin folder alongside the VirSorter symbolic links. Now you have a running VirSorter installation, however, you need the data pack to actually run it. Navigate to a directory where you want the data pack to live, and run the following commands. It doesn’t have to be the same location where you downloaded VirSorter. To run VirSorter, you will need to point to the path of the data-pack directory using the --data-dir parameter each time you run VirSorter. The original HMMs made available by Roux et al (2015) on CyVerse were formatted for HMMER version 3.0 (and were very hard to download). The HMMs in the updated data-pack are compatible with HMMER version 3.1b2. Then Meren uploaded this datapack here so it can be accessed publicly. It is critical that VirSorter is run on the exact same FASTA file that was used to generate the anvi’o contigs database, map and profile reads, etc. This point can’t be overstated! The FASTA headers should only contain letters, numbers, -, and _. Take a look at some examples here. Please note that the --db argument can either be 1 or 2. If set to 1, then VirSorter will use phage HMMs computed from RefSeq phages published before January 2014. If set to 2, then Virsorter will use all of the HMMs from option 1, plus additional HMMs from phage contigs identified in curated virome datasets. VIRSorter_global-phage-signal.csv: This file contains one line for each phage prediction. Often, this results in one line per contig, though very large contigs might have two or more prophage predictions. Metric_files/VIRSorter_affi-contigs.tab: This file contains one line per gene and includes any PFAM or phage domain annotations. The lines for all genes for a given contig are preceded by a line containing >Contig_name. If you have been using anvi’o for your metagenomes, I assume you already have your anvi’o contigs database. This will generate an output file called splits_basic_info.txt file, which we will use alongside with the output files generated VirSorter to import everything into anvi’o. To make sense of all these files, I implemented a program called VirSorterParser. VirSorter uses MetaGeneAnnotator (Noguchi et al, 2006) and doesn’t accept custom gene calls. Some of the predicted genes may not line up with what anvi’o has predicted on your contigs database. However, if you export your anvi’o gene calls and pass that file to the parser, the parser will attempt to get around this by matching up the start/stop positions of hallmark genes predicted by VirSorter with existing gene calls from your anvi’o contigs database. For each hallmark gene in a contig identified as phage or prophage where this matching is successful, the parser will write that gene and the VirSorter-predicted function to a file that can be imported into your contigs database using anvi-import-functions. For each VirSorter phage or prophage prediction that spans several splits, all other columns besides “split” are identical across splits. These four metrics are reported on the predicted phage or prophage, not on a given split. For example, if there are 86 genes and 3 splits in the phage contig, num_genes_in_phage will report 86 for split_00001, split_00002, and split_00003. The same is true for num_phage_hallmark_genes_in_phage. For the phage_name column, the first phage predicted by VirSorter is named phage_1 and increments by one up to phage_n. Similarly, the first prophage predicted by VirSorter is named prophage_1 and incrememts similarly. Briefly, the script takes as input the two output files from VirSorter, VIRSorter_affi-contigs.tab and VIRSorter_global_signal.csv, and the splits_basic_info.txt file from anvi’o. It also asks you which VirSorter database you used when you ran VirSorter. These are required inputs. If you want to test out the parser, samples of each of the required files are provided in the “sample_files” directory of this repository. If you run parser on the the sample files, specify “–db 2” on the command line. --exclude-cat3 will skip over all “category 3” predictions. --exclude-prophages will skip over all prophages. The -L parameter can be used to specify the minimum phage length to report in the output files. For example, -L 5000 means that all phage predictions shorter than 5000 bp will be not reported in the output files. These flags can be used in any combination with each other. If you want to import hallmark gene functions from predicted phage or prophage contigs into anvi’o, you’ll need to also supply the parser with --anvio-gene-calls all_gene_calls.txt and also a mapping file available in the VirSorterParser repository: --hallmark-functions hallmark_to_functions_files/db2_hallmark_functions.txt. The parser will generate two output files by default. The first is “virsorter_additional_info.txt”, which can be used direcly as an additional data file with anvi’o. For anvi’o v3 and earlier, you use this file when running anvi-interactive or anvi-refine by using the flag -A virsorter_additional_info.txt. This will generate a collection where each phage prediction will become a bin containing all of the splits for that phage. Congratulations, you can now enjoy an even better phage-aware binning experience in anvi’o! If you have any questions or problems, please don’t hesitate to contact me, or submit an issue on my GitHub repository. Importing VirSorter annotations into anvi'o to study phages was published on February 08, 2018 and last modified on February 08, 2018 .